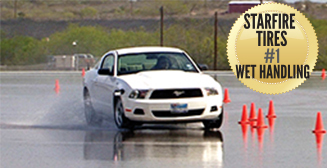 The wet handling test shows how well a tyre can be pushed around a simulated road course. The course has a number of real world characteristics such as evasive lane changes, heavy braking and sharp cornering, plus getting up to speeds where hydroplaning can occur. This test is measured by lap times. The faster the lap time, the more control and wet weather capability the tyre has. This gives you a tyre that can handle all wet weather conditions safely and give you greater confidence in your tyre that you drive on.